Stuff: Week Two "The Big Giveaway"
Last week I preached on how our garages, storage units and closets full of stuff have become our temples where we worship idols and sacrifice to demons. It was a rousing sort of sermon as you can imagine. If you read the previous post, then you know that my wife took what I said pretty seriously. And because my wife has the spiritual gifts of discernment, prophecy and persuasion... I basically just do what she says when she's had a "word" from the Lord. The sermon that I preached last week was essentially an admission that we have a problem... Christmas is in crisis. Our culture worships the false gods of Materialism and Consumerism at Christmas, and Christians are doing a lousy job of resisting the very same idolatry. But as most of us know, it's not enough to just admit you have a problem, you have to do something about it. 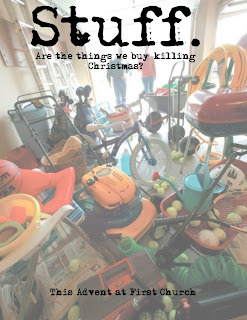 So... what do we do about all of our stuff? The Apostle Paul was gathering an offering for "the saints" who were in need. Presumably this was for the Christians in Jerusalem, who had fallen on hard times and were in abject poverty for the most part. Paul solicited gifts from the churches he planted around the world to show some love to the church in the Holy City. One of those churches was the church at Corinth, which apparently did have some fairly wealthy folks in it. Funny thing, though, Paul didn't ask the Macedonians to participate in the offering for the saints. It seems the Macedonians were pretty poor, and Paul didn't want to take advantage of their good nature. Apparently, their good nature was a whole lot more good and more forceful than Paul because they demanded to be included in the process. Paul was overwhelmed by the generosity of these poor Christians, who gave way beyond their means to help fellow Christians they had never met. Paul indicates earlier in 2 Corinthians 9 that he is planning on bringing some of the Macedonians with him when he comes to Corinth. He basically comes out and says, "Listen, you need to come correct, and make sure that you aren't ashamed in front of these people who gave more than they should have... so pony up." That's not what he said... he actually said that the Macedonians "gave out of their poverty." Who else said something like this? Oh yeah, Jesus did when we was teaching his disciples about giving when he saw a widow give two small pennies at the temple. For Paul the whole thing comes down to a generous spirit. He has three guidelines for generosity in fact. First, he believes that generosity requires resolve. "Those who sow sparingly, will reap sparingly, and whoever sows generously will reap generously" Paul says. And "Each of you should give what you have decided in your heart to give." Generosity is intentional. You don't just haphazardly live a generous life, it's planned and it's done with a great deal of hope. Being generous means that you are going to give without fear and trust that the harvest will be bountiful. Second, generosity is not coerced. When your generosity is linked to guilt or shame, it's not generosity---it's guilt or shame. Love that is coerced isn't love, for that matter. A generous spirit is a direct reflection of the love that we feel inside for God and one another---the kind of love that is sacrificial, unconditional and overflowing. Third, generosity should be a joyous act. Every single Sunday at my church we remind ourselves of the words of the Apostle Paul in this passage: "The Lord loves a cheerful giver." If generosity isn't coming from a place of joy, if it doesn't bring joy and if you don't feel joy when you're doing it... it's probably not generosity. Paul then goes on to explain what happens when you have a generous spirit and live in generosity. He declares that "in all things and at all times," you will have "all that you need." He asserts that when you plant generosity, you will "enlarge the harvest of your righteousness." He also says that you will be "rich in ever way, to be generous on every occasion." Now I'm no prosperity gospel preaching fool by any means. I don't believe that we give so that we will get. God isn't a slot machine that we put in a coin and get out a bunch of coins. But I do believe that God's ideas of riches and blessings are infinitely more intense and expansive than we could possibly imagine. AND as Paul points out in verses 12-15, the REASON we are generous is to bear witness to what God has done for us. So what does this have to do with STUFF? Here's a basic question: Is your stuff keeping you from being generous? What makes it so hard for us to give something away? "I might need it." Classic. As in, "I have never really used that [insert item here] but I can't give it away... I might need it." "It has sentimental value." Honestly, just about everything could have sentimental value if you so desired. "It's not just a spoon. I was eating ice cream with this spoon when David Archuleta didn't win American Idol." "It's part of a collection." So what if it's a collection of mixing bowls, or toilet brushes or chairs from Big Lots? If it's part of a collection, you simply can't part with it, right? "I paid too much for it to give it away..." This is a ludicrous excuse. The first computer I bought cost nearly $1000 and it was a 100 mghtz, non-pentium hunk of junk that had a modem slower than molasses in Vermont in February in the middle of the night. The computer I am typing this on right now is more powerful than the one that sent dudes to the moon. Who cares what you paid for it ten years ago? It's not worth jack today... unless it's a Honus Wagner baseball card. So when we finally get rid of all the excuses, maybe we can get rid of all of the stuff. And if we can get rid of all of the stuff, maybe we can focus on something else. I recently blogged about what my family and I are doing with our own Big Giveaway. We are beginning to realize that our stuff has been keeping us from being who God wants us to be: generous, giving, open and loving people. We're not going to participate in the madness this year. Because what we participate in, more than what we say reveals the heart of our worship. I want it to be evident that the heart of my worship is God and not my junk. Let's get busy. I've got stuff to give away.